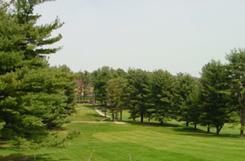 Derryfield Country Club is an eighteen-hole regulation public golf course located in the heart of Manchester, NH. Established in 1932, Derryfield is one of only three municipally-owned golf courses in the state of New Hampshire. Scroll the page to view the scorecard. Come Play The New Renovated Derryfield Country Club! Derryfield Country Club completed a major renovation of the course in 2015. The project consisted of a drainage renovation to holes 2, 3 5, 6, 13, 14, 15, 16, and 17. Over 15 miles of drain pipe was installed to keep those holes dry during the year after rain storms. A new irrigation system was also installed on holes 1,2, 3, 4, 5, 6, 13, 14, 15, 16, 17, and 18. New Greens were built on holes 2, and 3 and greens on holes 14, 15, 16, and 17 were restored to their original size and shape. New and expanded teeing grounds were added to holes 2, 3, 14, 15, 16, and 17. New fairway bunkers and greenside bunkers were added on holes 2, 3, 14, 16, and 17. A new cart path system was added to holes 1, 2, 3, 14, 15, 16, and 17. At Derryfield Country Club, you will find the Derryfield Golf Shop, providing you with equipment, clothes and rentals as well as three indoor golf simulators. You will also find The Derryfield Restaurant & Lounge, a full service restaurant and bar. We invite you to play Derryfield Country Club.